This is Marine General Douglas Stone and he's giving my current Nerd Love, Astrophysicist Neal deGrasse Tyson, a run for his money. According to this article in the Reader's Digest, he was identified by Gen. David Petraeus to head up the task group in charge of detainees and prisons in Iraq. He arrived in April of 2007, and hit the ground running. "Abu Ghraib was a leadership failure that telegraphed to 1.3 billion Muslims that we had no respect for them," he is quoted as saying. He considered it a moral failure that shamed us as a nation, and a betrayal of the military's core values. 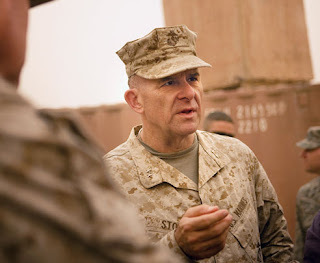 General Stone, you had me at "leadership failure." His unorthodox ideas and policies have led to unprecedented success in the Iraqi detention program, in spite of his total lack of experience in this field prior to this assignment. And yes, he's got the Nerd Cred - four master's degrees and a doctorate from Stanford, Pepperdine, the U.S. Naval War College, and the University of Southern California. That's my brother-in-arms, baby. Nerd Love. There's nothing like it. Nerd salute to my Hot Mom, who's got some Nerd Love of her own. I just realized that I have been oogling your Nerd Love Neal myownself. However, there is a commercial for, I believe, a large oil company that has the cutest man posing (or is he really one? )as a geophysicist. or something nerdy like that. Amy, we all have to grow up sometime. And I'm glad the new Squeeze is still around. Hmmmmm..Smart, strong, good leader and in uniform? Care to share? Def. Nerdy Love Material!